Generate more leads. Close more loans. Marketing can take lots of time. Time you may not have as a busy mortgage lender. Unify simplifies your marketing to save you time. 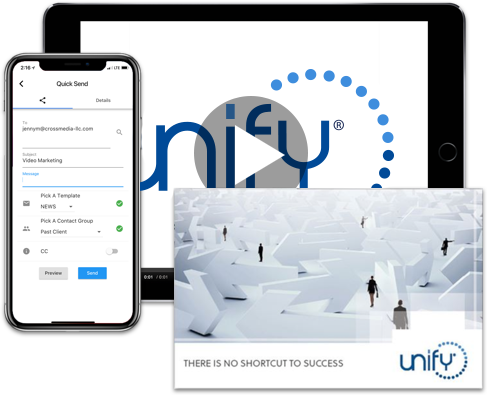 With Unify, you can automate your marketing, create difference-making videos, and send multi-channel campaigns in just a few clicks. You need your leads to convert into customers. And your customers to close. Unify’s Marketing solution can help move your pipeline in the right direction. Unify leverages industry-leading cloud-based software to make integrated multi-channel marketing easier for busy mortgage leaders like you. Generate more leads, nurture them, and close the loan with Unify. Email is one of the most effective marketing channels, We upgraded Unify email with CAN Spam compliance and tracking built in to make sure your message gets seen by the right people. Generate more leads by being top-of-mind with direct mail campaigns that deliver relevant messages to key leads. Set your company apart from the competition with video content that people love. Even better? Add personalization and dynamic data to maximize your message’s impact. Build relationships with important business partners by including them on your marketing pieces. Access hundreds of campaigns, emails, flyers, direct mail pieces, and more in just a few clicks to send key messages, generate more leads, and close more loans. Stay in touch more easily with “set it and forget it” event-driven marketing. Keep track of what you’re sending, who’s opening it, and who’s converting so your marketing can get more effective over time. 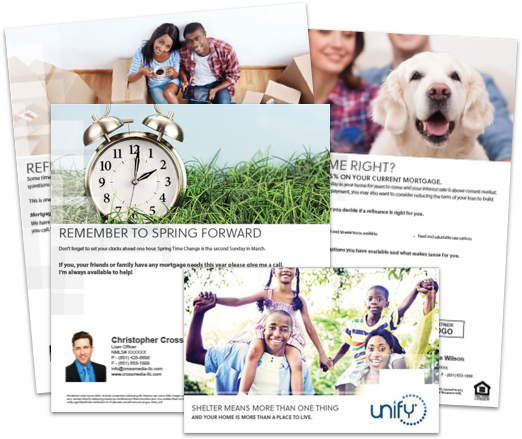 Unify helps to ensure that vital licensing and disclaimer information regarding company, branch and loan officer are included on each and every flyer, email, and direct mail piece. Unify keeps you compliant by automatically saving a copy and creating a report for every marketing event that takes place. Get mortgage marketing and so much more. From just-listed alerts to refinance alerts and lead generation to post-close marketing, Unify’s marketing solution helps you generate more leads and then track, nurture, and close them as with the contact management and LOS integration solutions. Unify is more than just marketing. It’s a true full-suite mortgage CRM solution.